Government to Business report card on Hurricane Harvey: who failed? In this article I dig deep into the immediate aftermath of Hurricane Harvey on the Gulf Coast. The flooding impact on Houston and surrounding areas has yet to receive formal disaster declaration at the time of writing. Due to the temporal nature of this event and how quickly things change on the internet I've included a lot more screen shots than I normally do. Apologies in advance. Imagine for a moment you run a business in Texas’ Gulf Coast. Right in the firing line of 130 mile an hour winds. You were smart, you followed the mandatory evacuation and safeguarded your family. One of your friends who owns a business around the corner from yours grabs your attention. By some miracle her cell phone has picked up reception. She passes it to you. It shows a social media a story about where your businesses were based. It’s not good. Together you start Googling to find out what support the government has activated for businesses like yours. Understandably results are news related. But two government results manage to sneak in. The second result is from Texas’ Health and Human Services department. Despite using the word “business” in my search term this page is only of use for citizens. The fifth result from the Federal Emergency Management Agency (FEMA) is at least a foot in the door. It announces via media statement that President Trump has declared a range of federal assistance for citizens and businesses. 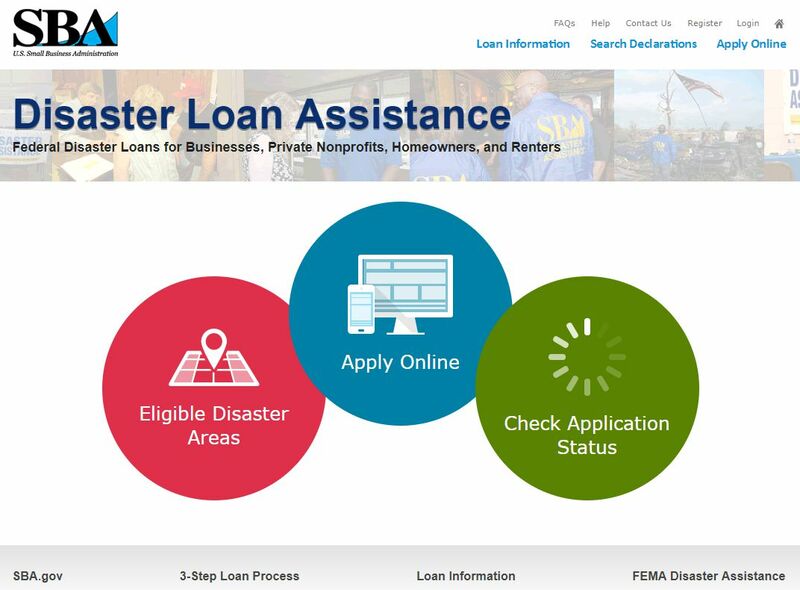 While the page isn’t exactly a one-stop shop for impacted businesses it does what it needs to do; link off to https://www.disasterassistance.gov/. 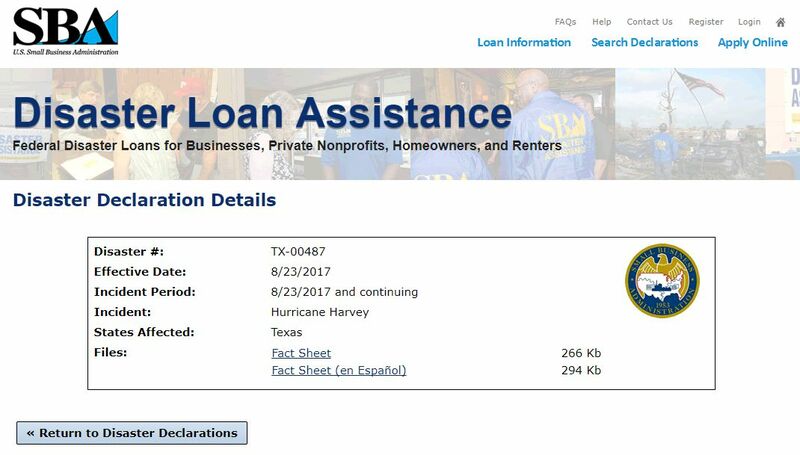 What bamboozles me is the lack of any call to action about Hurricane Harvey assistance on this home page. Three days after President Trump’s declaration here is literally nothing on the page. There are two prominent alerts though. 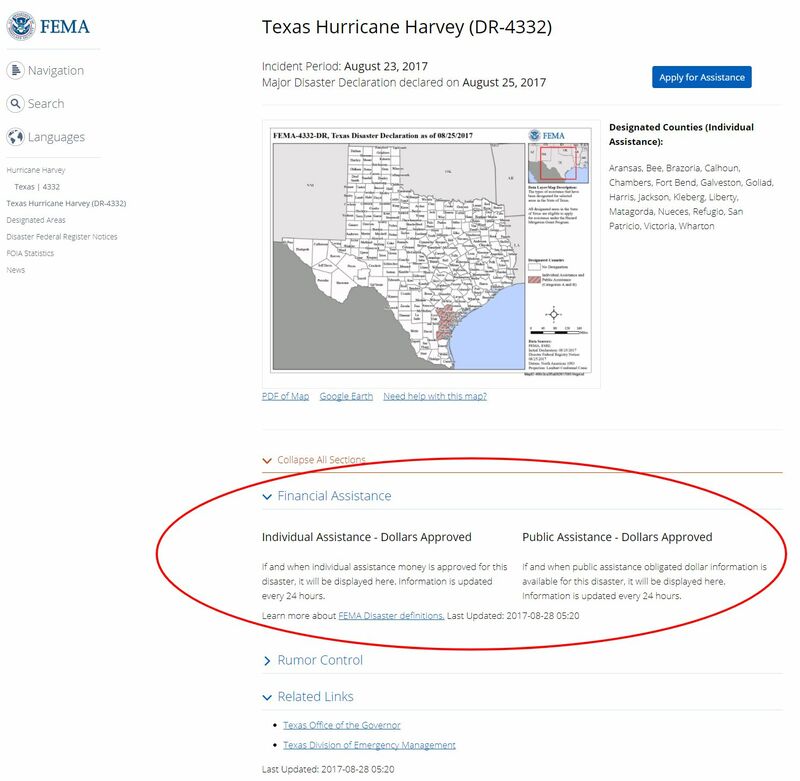 The National Flood Insurance Program link takes you to a page saying FEMA are developing a new website for floods and has information about the program. But with the page last updated over a month ago, and with no reference to whether this applies to Hurricane Harvey, business owners are left hanging. Worse is the second alert: a series of searchable resources for community leaders across the nation. But again this had no specific information about the current disaster and seems to be a website drive purely by search results. That works well for Google. I haven’t seen many governments make a success of that though! The homepage though does still get you to what you need. You just need to work for it. The prominent “Find Assistance” link takes you to a general diagnostic tool where the most you can find for businesses is loan information. To find any Hurricane Harvey specific information you need to drill down to the county (local government) level. This can be discovered through the search box above or a map of the United States at the state level which you can drill down to. But wearing the hat of the Texan business owner impacted by Harvey I just did that. And we’re back to square one. No assistance available. 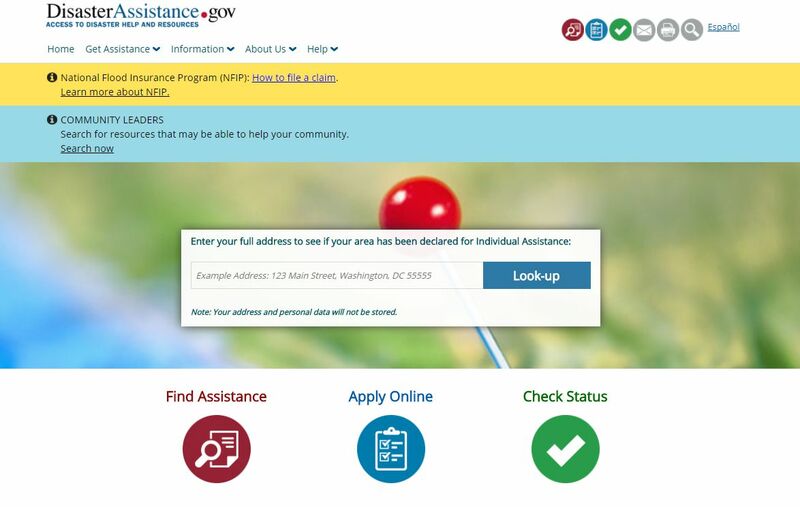 I did click on the blue “Apply for Assistance” button, but that just took me back to the DisasterAssistance homepage. You can click on the “Apply Online” link (next to the “Find Assistance” link to the diagnostic tool I tried earlier) and there’s a 10 page long online application. After going around in circles this is encouraging. But at this stage it is still unclear what, if any, business assistance there is. Three days out from the President’s declaration the online experience for business owners should be up and running. The Disaster Assistance Improvement Program - operating under FEMA - have had Katrina and Sandy to prepare for Harvey. They should be doing a lot better by now. It doesn’t help that they’re patting themselves on the back. So putting Google aside as a starting point for disaster support what do the main government websites offer for businesses? The Hurricane Harvey page has up front - as it should - safety tips for what is an ongoing disaster situation. For Assistance all it does is link to DisasterAssistance.gov which as we know by now isn’t helpful. This page breaks the cardinal sin of customer self identification: lumping business owners in with general citizen services. 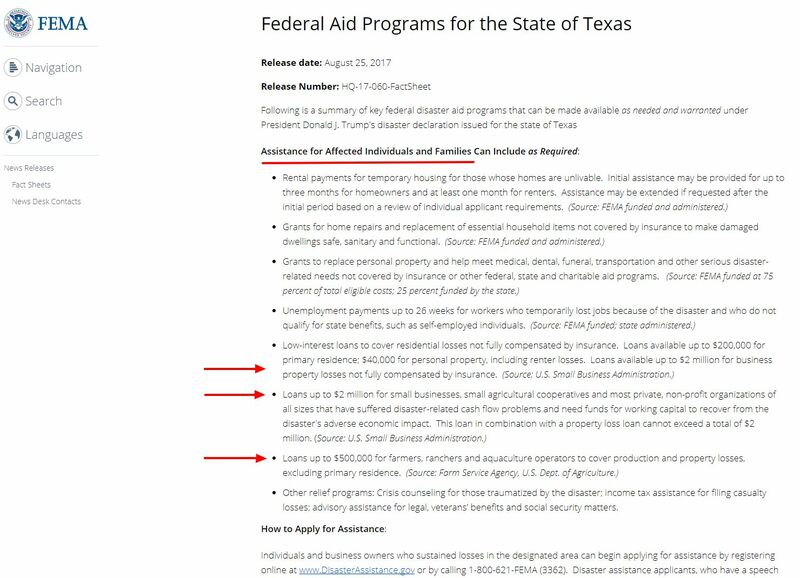 The page in fact sprouts the heading “Assistance for Affected Individuals and Families.” No mention of business at this level whatsoever. Research with business owners around the world shows over and over again that business services mixed in with citizen services is a sure fire way to drive business owners crazy. This media release makes it worse by literally not mentioning business support until the fifth source of funds and even then burying it at the bottom of the paragraph. Then sixth and seventh places may also be relevant if the impacted business operates in the agriculture industry. A great homepage experience goes rapidly downhill fast. Taking impacted businesses off to a confusing Disaster Assistance site isn’t good. Burying information in media releases that lump business owners in with citizens is bad. Deprioritizing them is worse. FEMA could be achieving so much more. It needs to try harder. 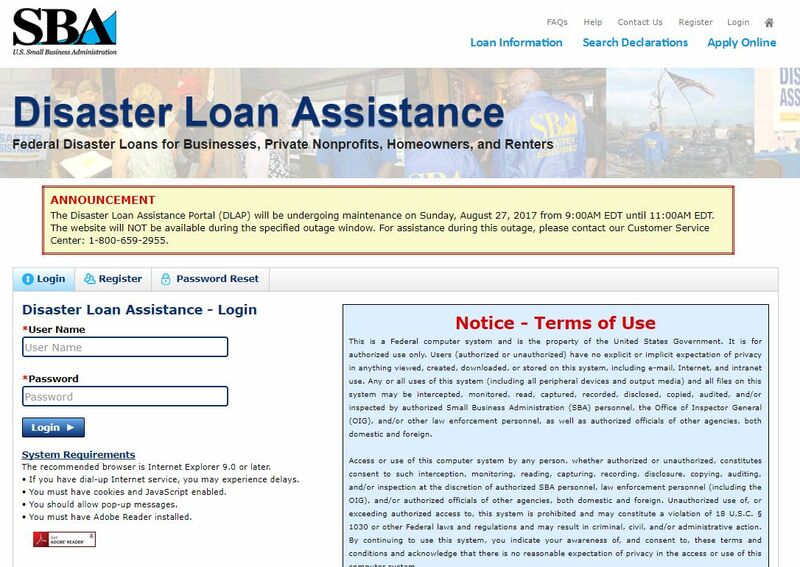 The Small Business Administration as identified above provides low interest loans to disaster impacted businesses. But unfortunately if you start there for your Hurricane Harvey experience… good luck. Despite the great design and high level information architecture, there is no prominent call to action for small businesses affected by the hurricane. It’s almost like SBA’s design is so constructed in such a way that straight jackets them from making any alerts. If that’s case it’s a serious case of neglect. Every government that provides financial and other support to disaster impacted businesses should anticipate this in their design and have in their content management system the ability to switch this section of the site on and off. Once you mouseover there is a generic apply for disaster assistance link. Again with the amount of time since the disaster occurred, I am very surprised that this hasn’t been updated and contextualised to the present recovery effort. Visiting “Eligible Disaster Areas” did return a list of declared disasters, Hurricane Harvey at the top of the list. So that was a positive find. That two page document did have some useful information about loans and eligibility but really in 2017 this shouldn’t be done through unfriendly PDF documents. Disaster impacted businesses are highly likely to be searching online using their cell phones. Have you ever tried reading a PDF document on your cell phone? I thought it was bad at this point that the fact sheet only provided information about applying through a link in the small print. But I was wrong, it was going to get worse! They put the system down for maintenance during the middle of a disaster. Are you kidding me? Great glossy homepage but mediocre after that. Has potential and with better planning and application it should be passing. Hallelujah! At last a government agency gets what it needs to do! A long narrative page with links about managing livestock and other agricultural matters. It’s written in the context of Harvey but isn’t the easiest piece of content to read. The radio stories are a pleasant find. A series of one minute mp3 and wav grabs about preparing and responding to Harvey are great and a smart use of the technology. But the USDA web team really should have got their editorial folks to convert these into easy to read written content. Similarly USDA have a great "Ask the Expert" database that has plenty of answers to common questions about flooding and other aspects of disaster prepartion and recovery. But its buried, almost in a throw away line at the bottom of the page. 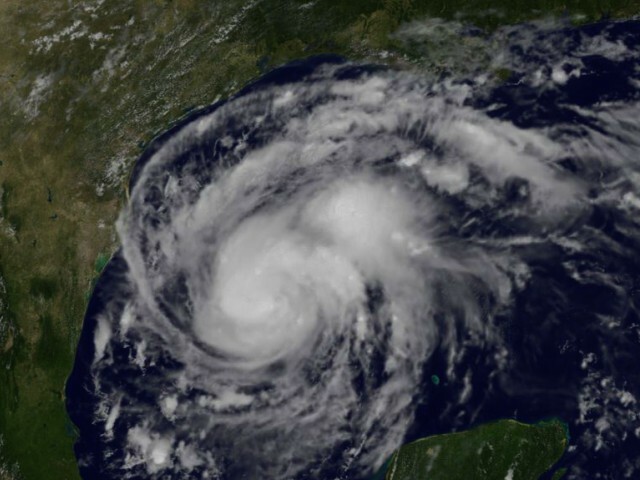 USDA is making a serious effort to help out farmers and ranchers affected by Harvey. 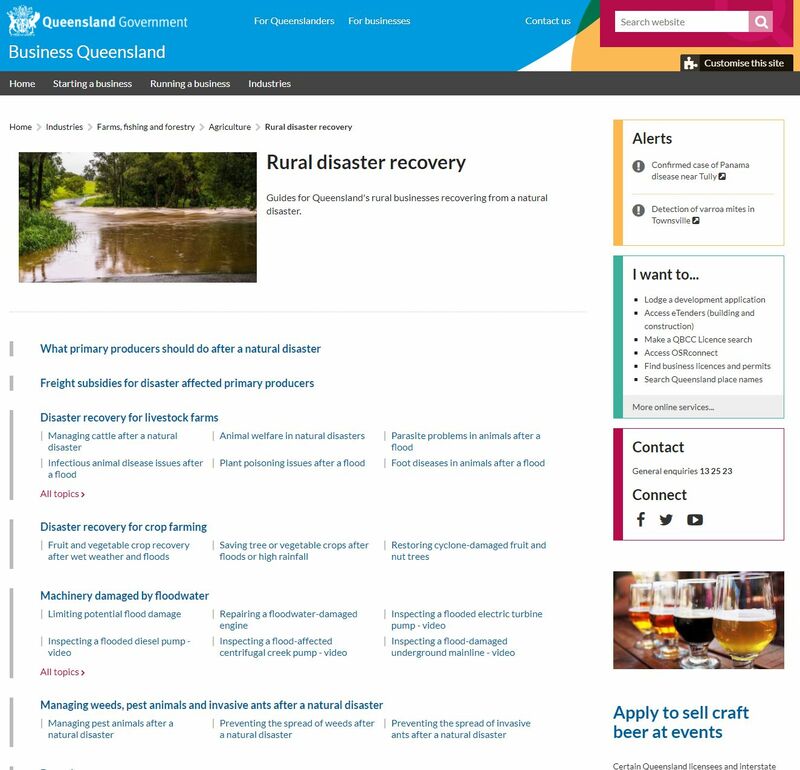 It should look to over high performers, like this example about disaster recovery for the agriculture industry in Queensland, Australia if it wants to get an “A” next time. After looking at the federal government, it’s now time to examine the affected state. 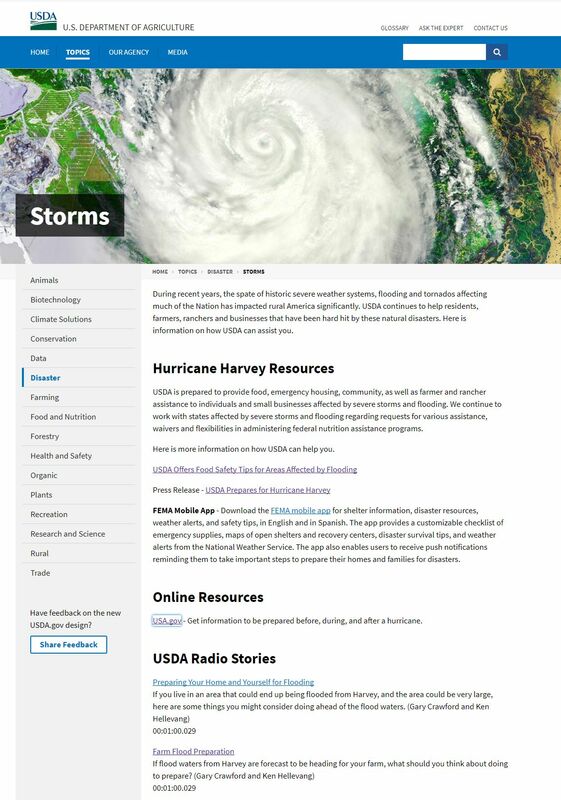 Like SBA.gov, the Texans seem to have implemented a website capable of changing for disasters. Although with the unmissable Harvey warning that makes up for it. But unfortunately the dedicated page about Hurricane Harvey continues the well established precedent of texas.gov of ignoring businesses in favor of a citizen-centric view. 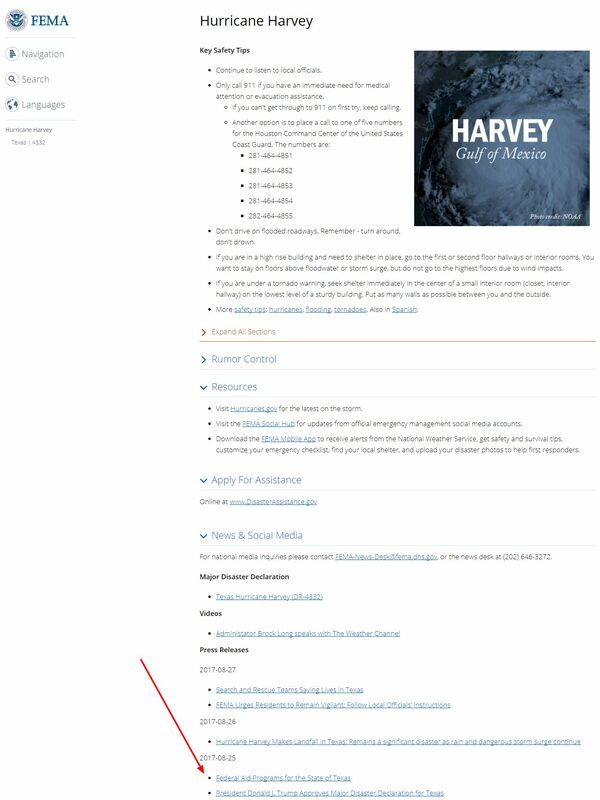 A massive eye catching Harvey link on the homepage doesn’t make up for a total lack of any information and support for Texas businesses. Summary: what can you learn from disaster recovery for your Government to Business website? While federal and state agencies can never anticipate what disaster will hit where, basic contingency planning should mean you have a fair amount of it waiting and in place. Yes, citizens are horribly affected by disasters. But businesses are too. They provide jobs and livelihoods and deserve just as much love and attention from government agencies. So if you’re responsible for your Government to Business website, learn from the experience of Hurricane Harvey.